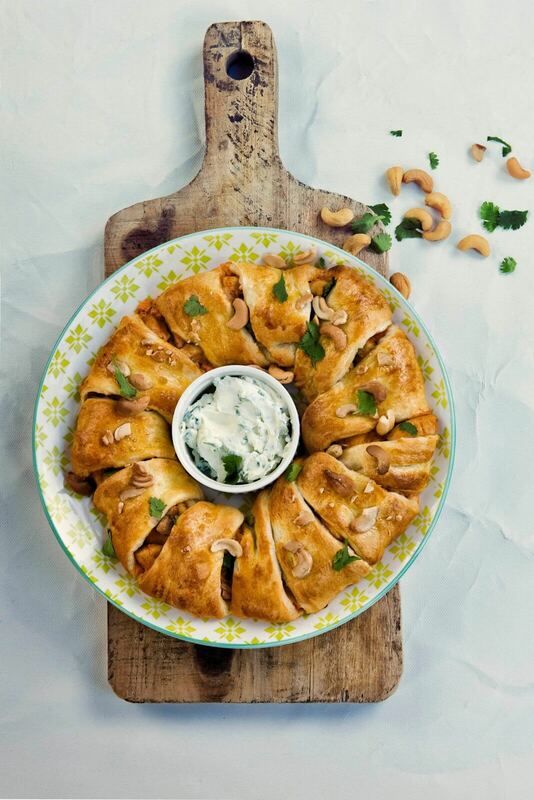 With this delicious chicken curry croissant garland, you can make your meal just that little bit more special. Delicious with curry, chicken, and cashew nuts. Bake the chicken and once finish, set it aside to cool. Add the red curry paste to the yoghurt until this is a lighted mixture. Next add the chicken filet and cashew nuts. Save some cashew nuts for the end. Open the can of Danerolles Croissants Extra Large. Cut the croissant slices in half (start at the point and cut your way up) and create a star on the baking tray using the croissant dough, in such a way that there is a hole in the middle and the points are facing outwards. Spread the chicken curry mixture on the wide sides of the dough and sprinkle some cut coriander over the mixture as well. Also save some of the coriander for the end. Fold the ends of the dough to the middle and brush some egg yolk on top. Bake for 25-30 minutes in the oven at 200 degrees. Once it is finish, spread the left over cashew nuts and coriander over the dish. Make a dip sauce with yoghurt and coriander and some lemon. Amounts don’t matter, add what you want and then enjoy it together with the dish.